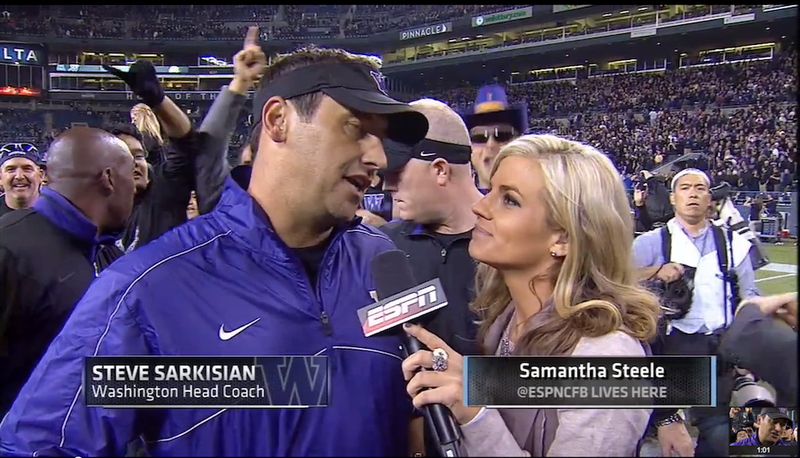 How Did Samantha Steele Become Erin Andrews's Replacement? First, She Got A Hostess Job At An ESPN Zone. Samantha Steele graduated from college three years ago and has been with ESPN for just over a year. Now she's Erin Andrews's replacement on College GameDay and has Thursday night sideline duties. How'd it all start? The Schwab's Pharmacy routine actually sorta worked! She got the restaurant job, and within a couple of months she met someone who worked at ABC Sports Radio, who got her an internship. In short order, she got a job at Fox and then ESPN's Longhorn Network last year. And this, folks, is how you go three years removed from Liberty University to ESPN's newest star and Christian Ponder's love interest. Unfortunately there are only two ESPN Zones left in the country (one in Anaheim, the other in L.A.), so best start your work in southern California.